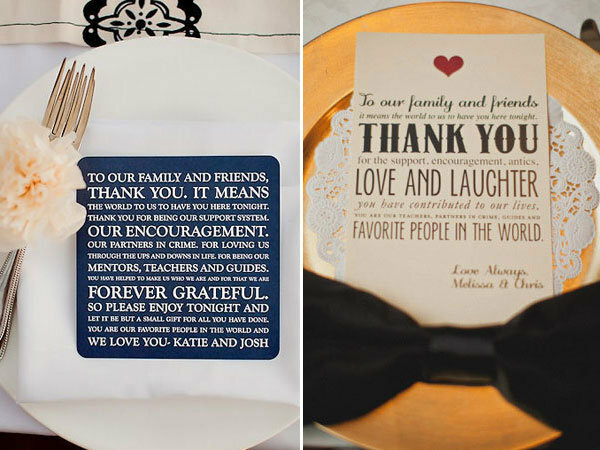 Here are some fun ways to give thanks before, during, and after your big day. 1. Keep a gratitude journal. Unlike a regular diary, which requires daily upkeep, jot down quick thoughts about your planning “highs” (e.g. what you felt like when you bought your dress) whenever you have the time. Also, use it to store fun mementos (like your gown consultant’s business card). 2. Spend quality time with your maid of honour and best man. Before my friend’s wedding (where I was a MOH), we had a beauty-prep day where we got massages and mani-pedis. We capped it off with lunch at one of our favourite restaurants. I loved getting quality time with her before wedding chaos took over. Thank your future spouse for marrying you and making you the luckiest woman alive. 3. Exchange letters on the morning of the wedding. Sure, “meet you down the aisle” texts are charming, but there’s nothing quite like putting pen to paper. I know my fiancé Jason will smile when he reads my chicken scratch and “I love you to the moon and back” salutation. 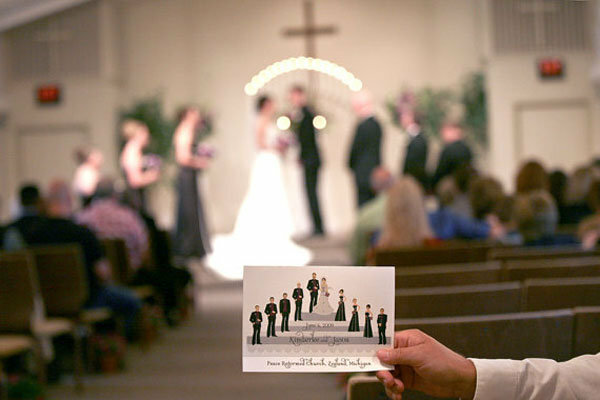 Capture each other’s reaction on film by reading the letters out loud for your videographer. 4. 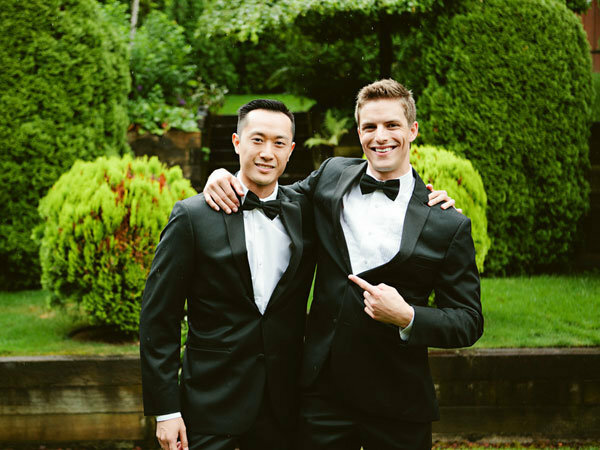 Unveil a fun wedding surprise for your groom. Is ESPN the soundtrack of your home? Give a nod to his sports obsession by having guests sign a jersey as your “guestbook.” Did he spend his childhood (and beyond) secretly wishing he was Spiderman? 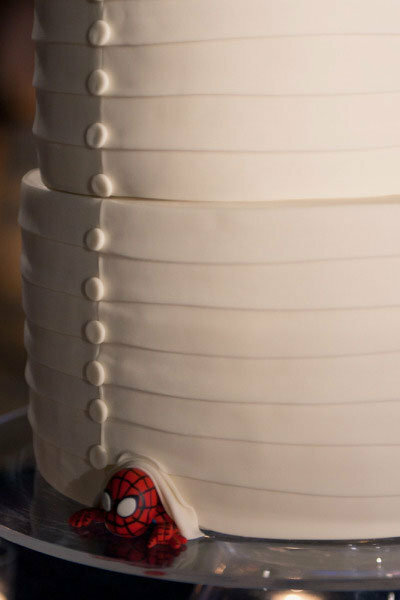 We’re smitten with this new take on the groom’s cake! Thank Mum and Dad for being the best parents in the world. 6. Wipe away their tears of joy. 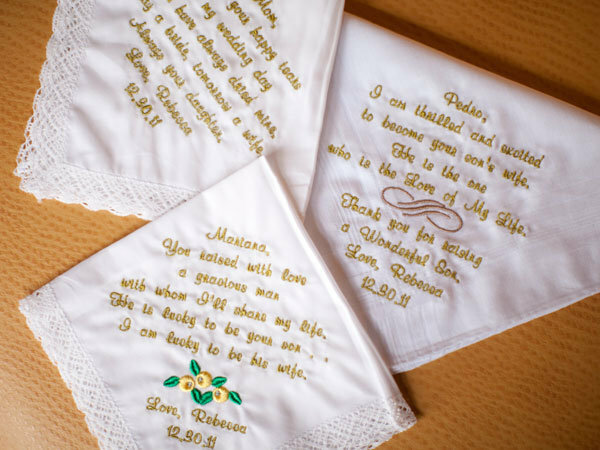 Personalize vintage handkerchiefs with embroidered messages for Mum, Dad, your mother-in-law, father-in-law, or any other close family members. 8. 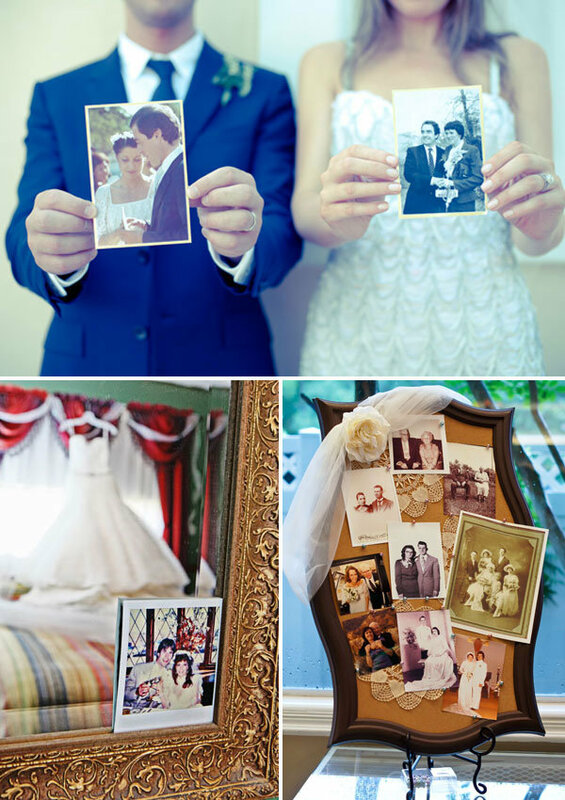 Honour their marriage by incorporating their wedding-day photos. 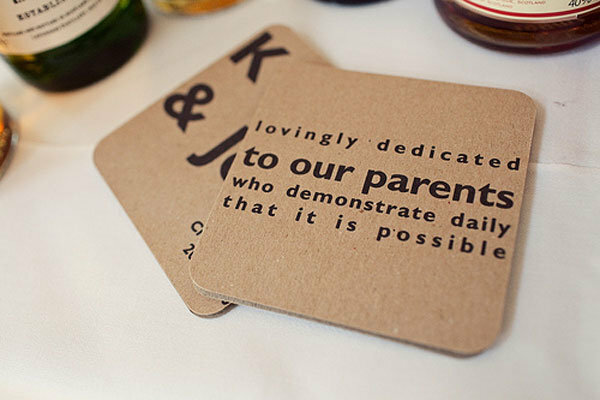 Whether it’s one small photo tucked into your armoire or a dedicated corner at the sign-in table, they’ll appreciate the sentimental touch. Photo Credits (from top to bottom): Ana Lui; Zenobia Studios and Ashfall Mixed Media. Or, have your photographer help you re-create one of their favourite shots! 9. 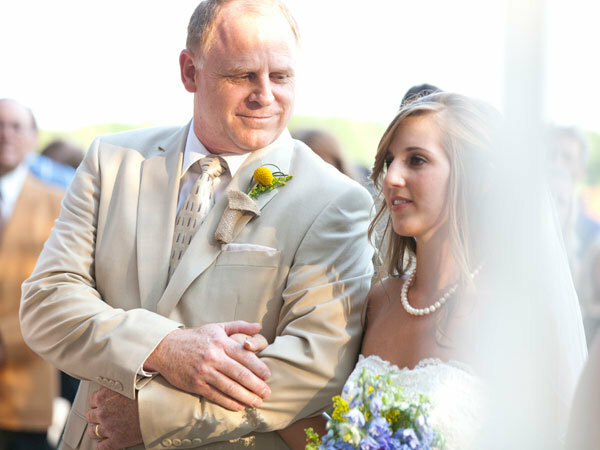 Carry a piece of them down the aisle with you. 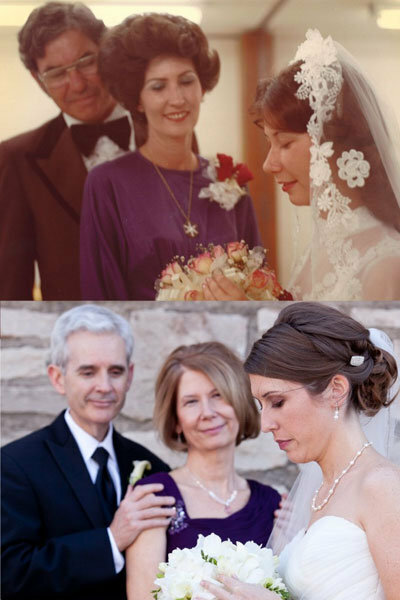 I plan on using a sleeve from Mum’s wedding dress as my bouquet holder (like the one pictured at right), but it would also be sweet to hang miniature childhood photos from your flowers. 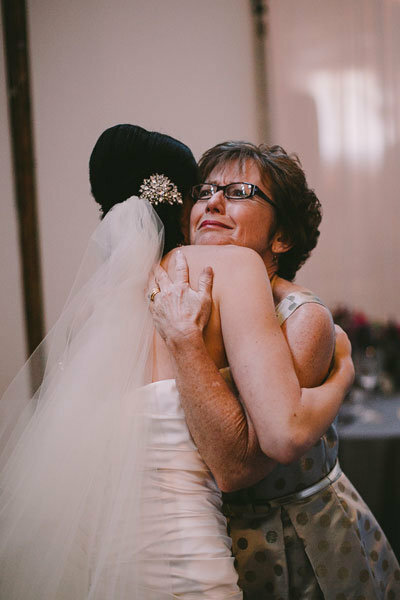 Instead of doing a bouquet toss, give a speech at the reception dedicating your bouquet to the most important woman in your life—Mum. 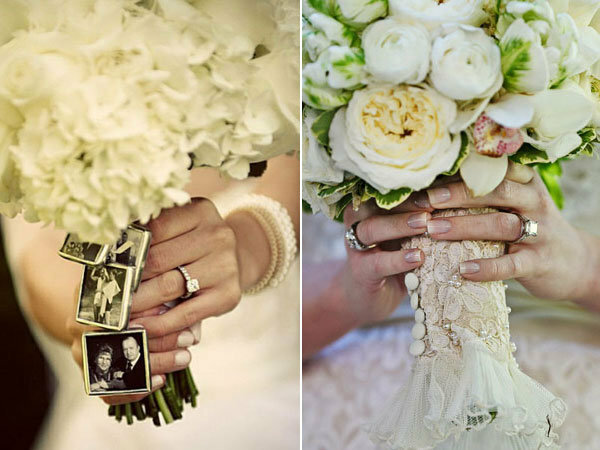 Bouquet at left photographed by Alisha + Brook Photographers. Bouquet at right created by Edge Design Group; photographed by Nadia D. Photography. 10. Give them one last hug before you’re pronounced husband-and-wife. Take the time to stop for one final display of affection. Just remind them that the officiant is waiting if they refuse to let go. 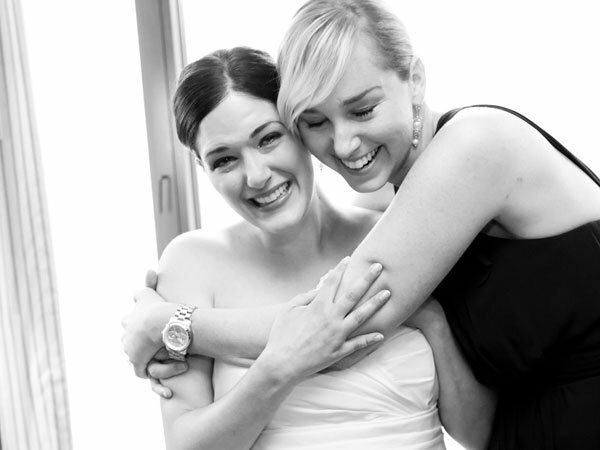 Thank your bridal party attendants for sharing in the joy of your wedding day. 11. Toast to all of the times that they supported you. 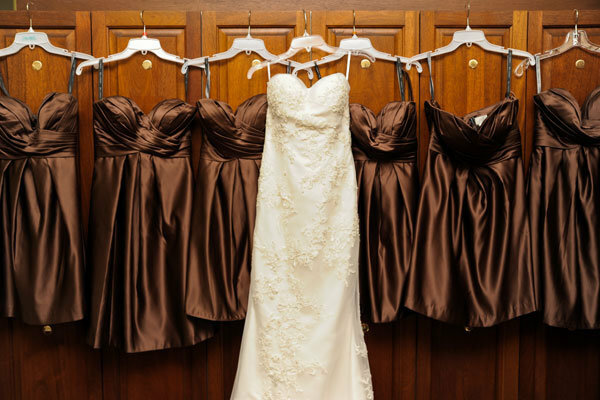 Give out one glass of bubbly to each bridesmaid before you hit the road! 12. Give them a gift they’ll actually use. 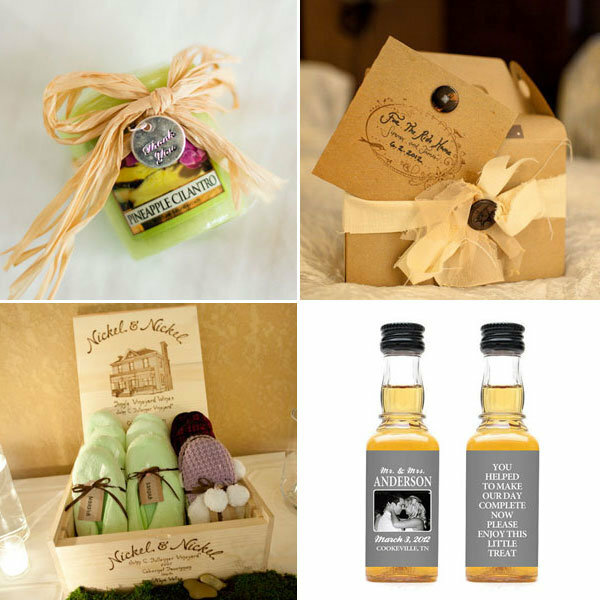 Check out 40+ ideas for bridal party presents, here. 13. 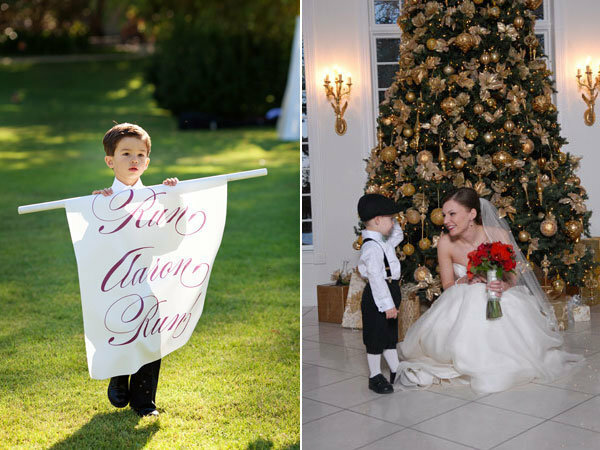 Spend one-on-one time with your flower girl and ring bearer. Give them a bucket filled with crayons and activities to keep them busy at the reception, let them play with your dress, and say “cheese” in the front of the camera for their very own portrait. Photo Credits (from left to right): Joshua McCoy Photography and Angel Canary Photography. Photo Credits (from left to right): Ian Grant Photography and Jason Kaczorowski Photography. 14. 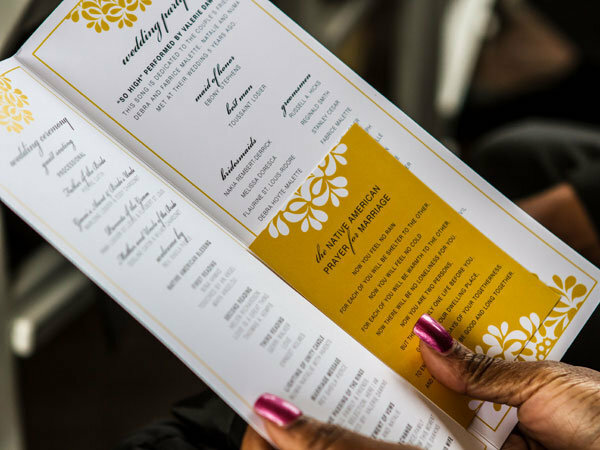 Give your bridal party kudos in your wedding program. Explain what their relationship is to you (a sister, friend, coworker) and any fun facts if you have room for them. 15. 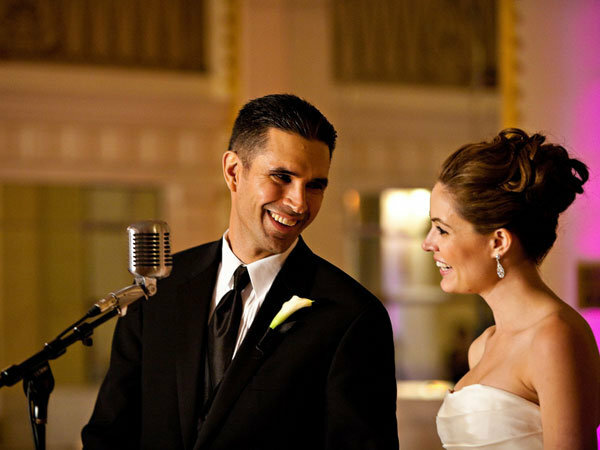 Dedicate a special song to your ‘maids and groomsmen. Don’t require them to practice a dance beforehand, unless you’re Zumba buddies or were in a dance troupe back in high school! Just have your DJ or band play a song from your past and watch unscripted hilarity ensue. 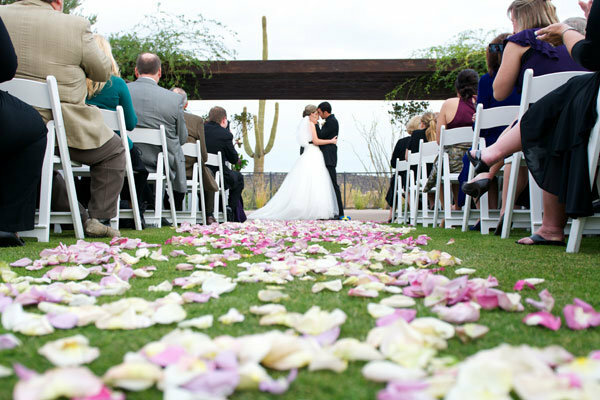 Thank your vendors for making your wedding vision come to life. 16. Tell them exactly what they did that you loved. 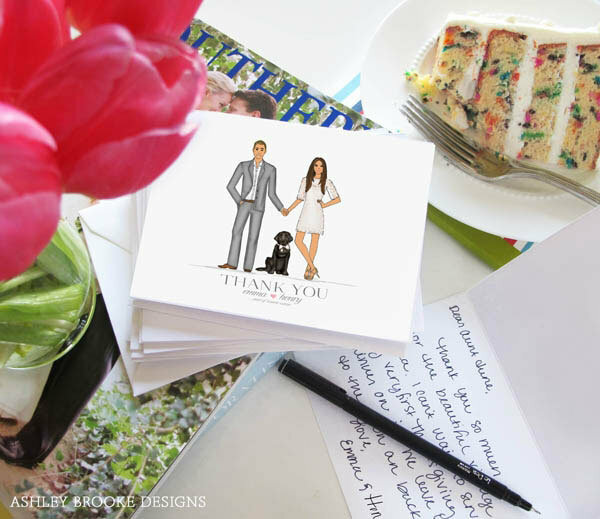 After all of those emails, calls, brainstorming sessions, and, yes, the times that they saved your behind, express how much you appreciate them with a heartfelt card. Pay it forward by writing a positive review online, if you were happy with their service. 17. Give vendors a shout-out in your toast. 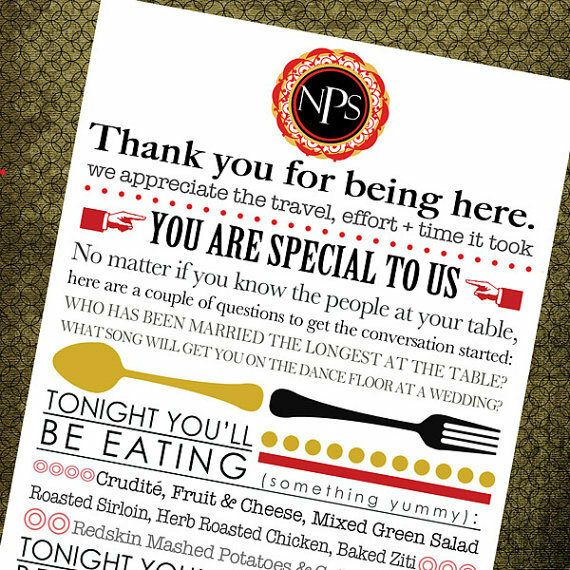 If you plan on saying a few words to welcome guests to the wedding reception, mention all of the vendors who helped make your night (or day) a success. 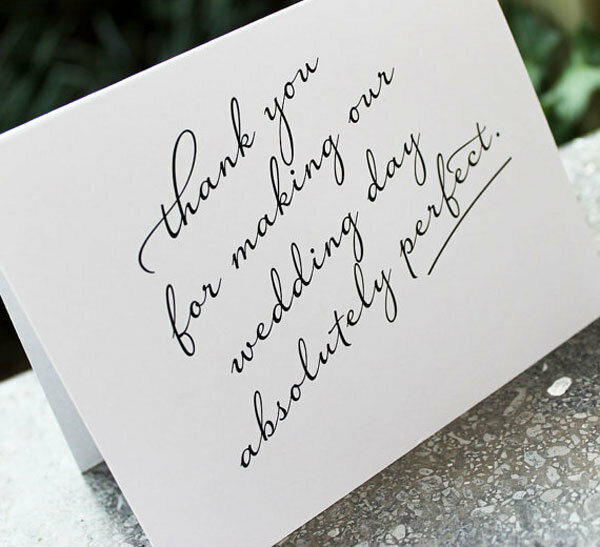 Thank your wedding guests for celebrating with you. 18. 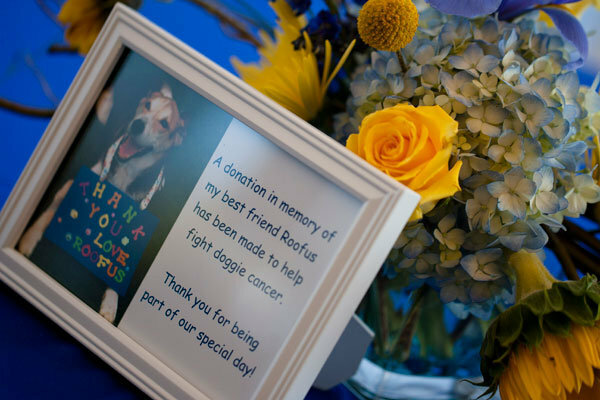 Create a heartfelt guest book alternative. 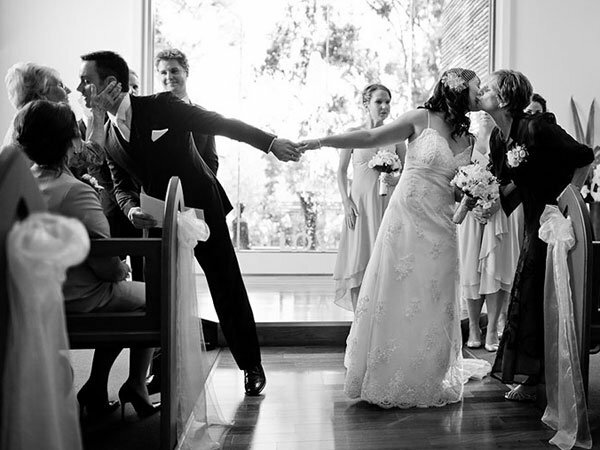 Your wedding day is the one time when you’re surrounded by everyone who loves you, all in the same room. 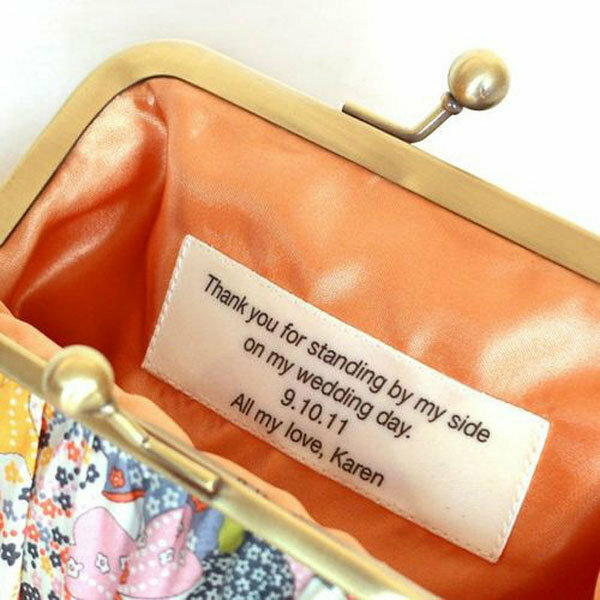 What better way to bottle up all of their good wishes than by preserving and displaying them in your home afterwards? 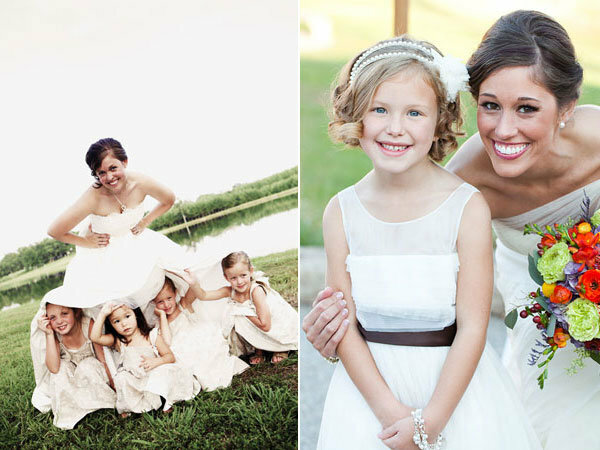 Photo Credits (from top to bottom): K and K Photography; Rachael Foster Photography and Joy Marie Photography. 19. 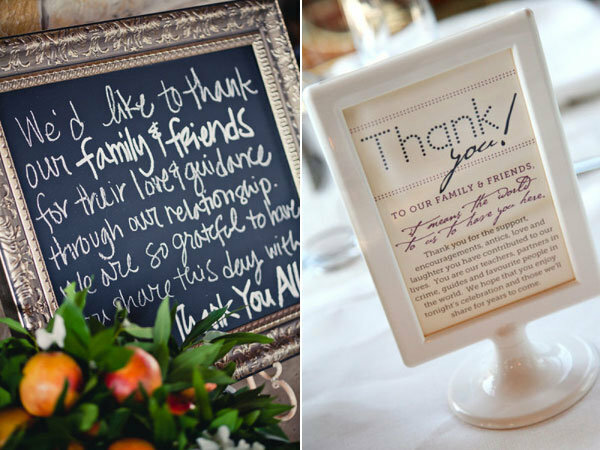 Incorporate “thanks” as part of your wedding décor. Quick, simple, and wow-worthy. 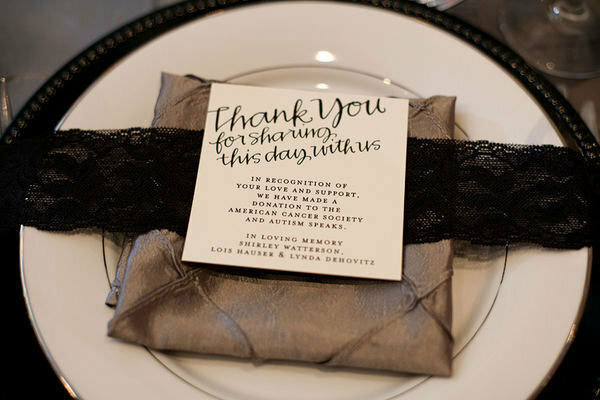 A special thank-you as guests sit down to eat. Photo Credits (from left to right): The Youngrens and Taylor Lord Photography. Or, include a meaningful blessing or prayer. 20. Give out thoughtful favours. Gift creature comforts like cozy slippers, a yummy scent or donuts for the ride home. 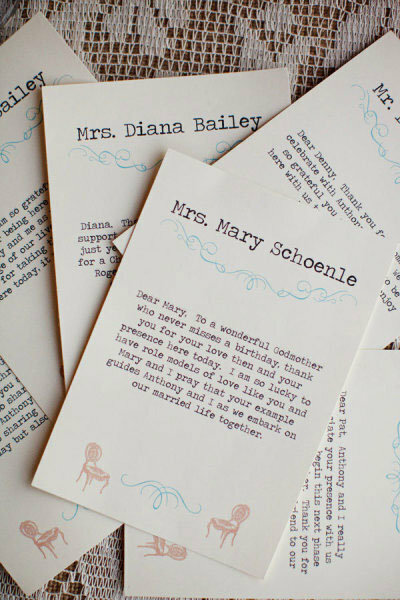 If you’re having an intimate wedding, include individual notes written for each guest. 21. Have fun with your thank-you cards. A custom illustration makes signing all of those notes that much more bearable (and, dare we say it, fun). Include a “thank you” shot in your must-shoot list! Check out more fun photo ideas here. 22. Pay it forward and give back to your community with charitable favours. 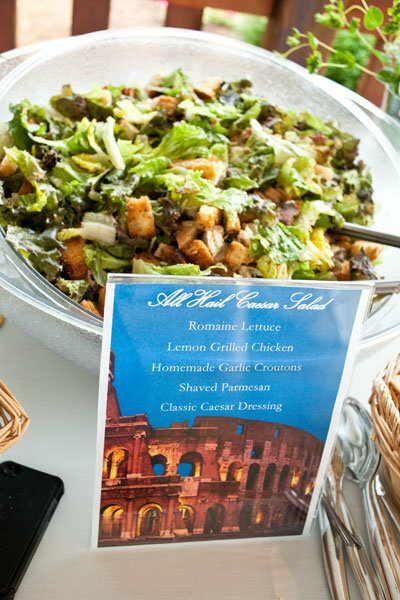 Give guests a choice and let them decide between a couple of different causes so they can pick the one that’s closest to their hearts. 23. Donate your dress. You’ll never wear it again, right? After the big day, hand it—and other accessories—to organisations which will resell it and use the proceeds to help a woman with cancer. 24. Donate flowers. Hospices and nursing homes that could use some cheer. 25. Donate food. Arrange to have any extra food from your reception “rescued” to feed hungry people in your area. BONUS TIP: Keep the spirit of gratitude going in your marriage. 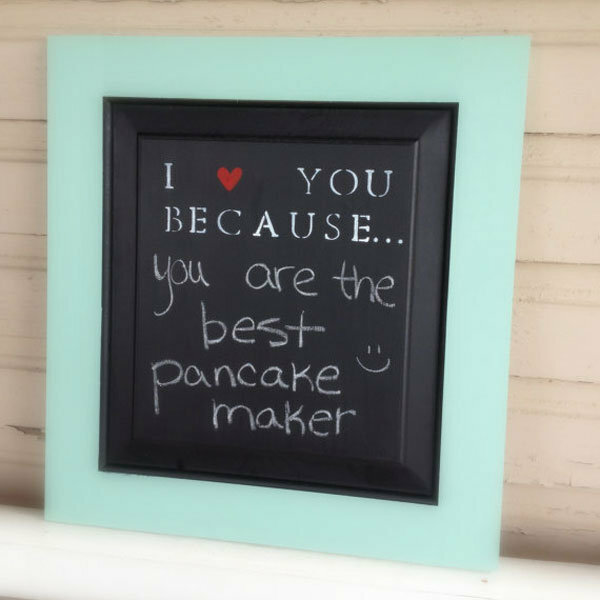 Leave secret messages for your spouse to find. At dinner, take a cue from The Queen of Giving, Oprah Winfrey, and tell them about three blessings that happened to you on that day. “When you focus on what you have, your abundance only increases,” the talk show host has said.